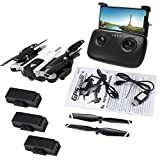 · The drone is equipped with a 1080P wide-angle lens (720P), real-time image transmission WIFI FPV, connected to your mobile phone, the view can be displayed on your mobile phone. · Precise locking height and stable stillness prevent fear of taking photos or videos and improving quality. · If the aircraft is under control or low battery, it will return automatically. · GPS positioning, remote control can be controlled up to 300 meters.